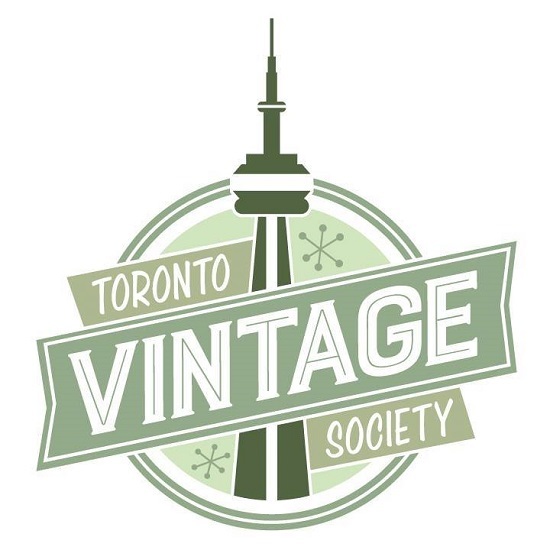 Toronto Vintage Society: Let's Talk Tiki! With the Toronto Vintage Society’s TIKI LANI LANAI event coming up on August 29th, you might be wondering: what IS Tiki? How did it become such an obsession? Where did Tiki culture come from? Fear not, dear TVS reader, we’ve got all your answers covered! Tiki is more than just drinking Mai Tai’s out of coconuts at a Luau (well, perhaps it is in its most watered-down version). Read on to discover everything to ever wanted to know about Tiki! Tiki is rooted in Polynesian and Maori culture and mythology. ‘Tiki’ means “the first man” in Maori, and true Polynesian/Maori culture is completely different from the Tiki culture and lifestyle that boomed in the 1960s. 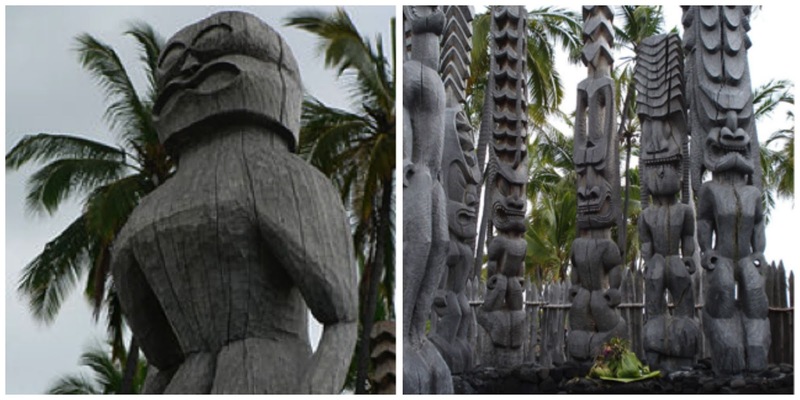 Ancestors were worshipped as part of the Maori belief system, and large wooden carvings with human forms and faces called ki’i were created to honour the gods (similar to Totem poles). Polynesian people carved the ki’i to resemble their gods, who they then thought would inhabit the carvings if they were pleasing. 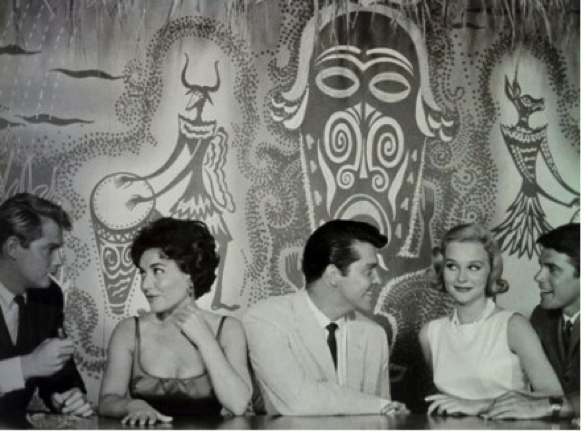 So, how did we get from ancient carvings to the kitschy Tiki culture we know today? 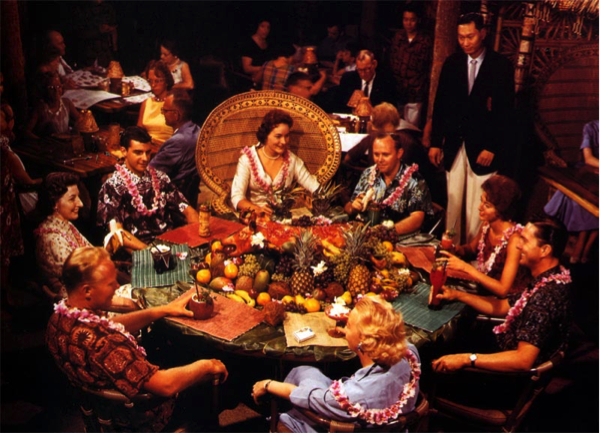 Tiki culture exploded in the United States in the early to mid-20th century. In the 20s and 30s, as travel became more accessible to affluent Americans, many took their vacations in the South Pacific. 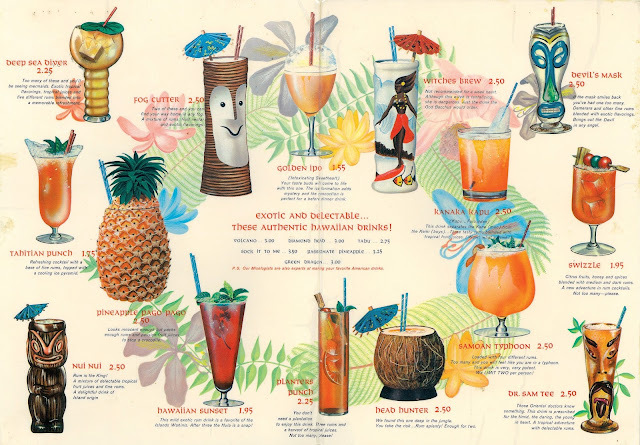 Capitalizing on the popularity of warm summer island breezes, laid-back lifestyles and tropical fruit, Hawaiian-themed bars started popping up in the 30s. The end of Prohibition in 1933 in the U.S. further propelled the onslaught of tropical bar openings. One bar in particular is credited with starting the Tiki bar craze in America: Don’s Beachcomber Café in Los Angeles. 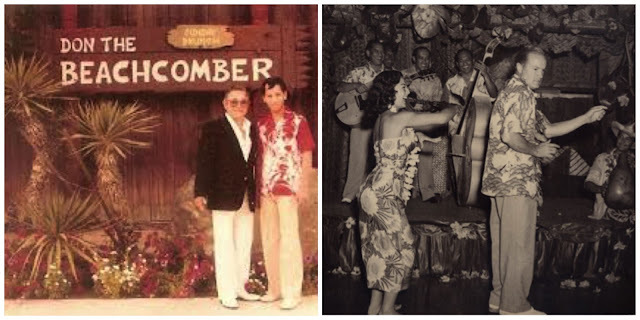 Opened in 1934 by Ernest Raymond Beaumont-Gantt, who had spent time travelling in the South Pacific, his Polynesian-themed bar and restaurant, complete with rattan furniture and tiki torches, drew crowds and celebrities from all over. Along with serving Hawaiian and Asian inspired cuisine such as Pu pu platters (assortments of meat and seafood appetizers), he invented his own tropical rum-based cocktails mixed with fruit juices and gave them exotic names (he claims to have created the first Mai Tai). The instant success of the Beachcomber, as it was called, created new competitors who were looking to cash in on the love of all things Tiki. 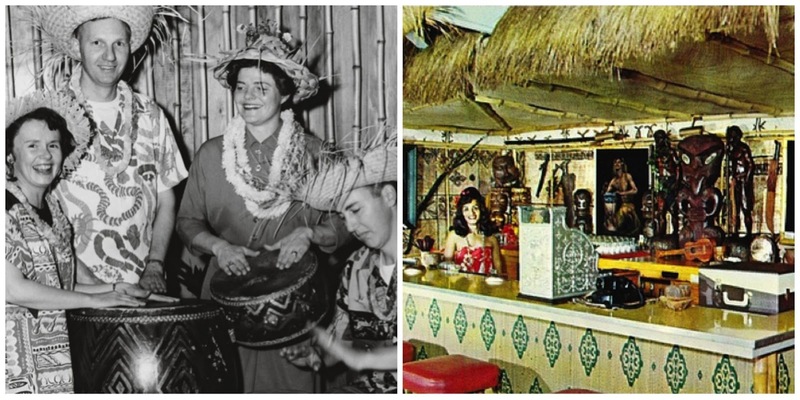 Until the 50s, however, Tiki-themed bars and restaurants were still regular upscale establishments, and sought to have some level of Polynesian authenticity to them (even remotely). People were still required to dress up in suits and dresses to enter and the establishments tended to cater to the wealthy. 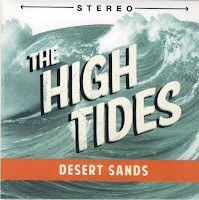 The popularity of Tiki continued to grow and peaked in the 1960s, after young soldiers who had served in the South Pacific during WWII returned to the US, bringing with them the memories of tropical beaches, flowers and beauty of the islands. 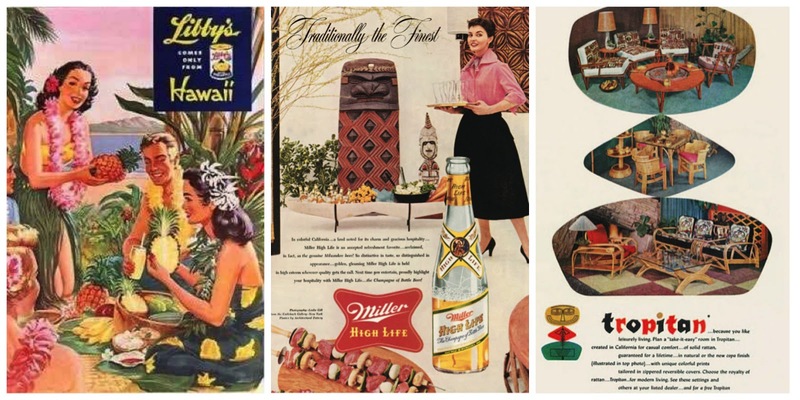 Along with the addition of Hawaii as the 50th state, Americans embraced the pop culture version of the easy breezy and colourful Tiki lifestyle with open arms, and all the kitsch that came with it. It wasn’t enough anymore just to go out for a drink or a meal – going to a Tiki bar or restaurant was an experience. It was the next best thing to getting on a plane to Maui. People enjoyed dancing to live drum-heavy jazzy Polynesian music, watching dancing Hula girls and drinking fancy cocktails decorated with fruit and mini umbrellas out of coconuts and Tiki mask mugs while donning their favourite Hawaiian shirt. You’d leave at the end of the night with a Lei around your neck and a souvenir mug in your hand…and a giant Tiki-induced smile plastered on your face. Tiki pop culture spread outward from restaurants and bars into the home. Soon enough, not only could you buy your own rattan furniture, tiki huts and carved mugs, but Tiki had permeated culture so much (particularly in California) that entire apartment buildings and hotels had Tiki themed décor. By the early 1970’s, Tiki was out and disco was in – people put away their leis and tiki mugs and turned away from the weird and wonderful exotic kitsch they had enjoyed for decades. But Tiki didn’t die out without leaving a lasting mark on society. So much so, in fact, that there was a Tiki revival a couple of decades later in the 1990s. Tiki started popping up again on TV and in films, and suddenly there was a new appreciation for fancy tropical cocktails and Tiki bars. Perhaps not as popular as it had been as it was in the 50s, but you can still find plenty of Tiki today if you look. 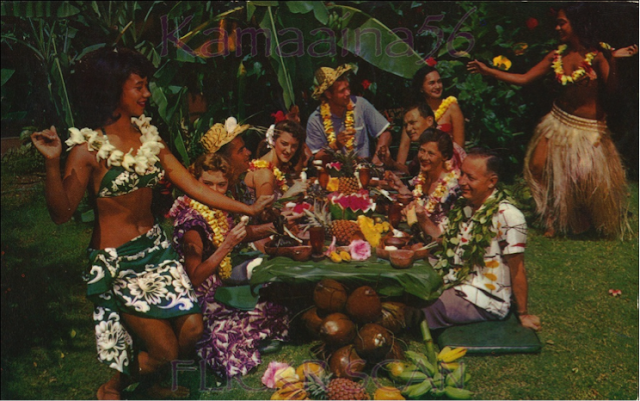 Across North America, luaus are held at some of the oldest and greatest Tiki bars in existence; you don’t have to look too hard to find summer pig roasts; and rum-based cocktails such as Mai Tais have become as much a part of cocktail culture as a Tom Collins. You can pick up bamboo furniture and outdoor tiki torches just about anywhere, and new tiki bars have sprung up all over North America in recent years. Appreciation for Tiki is alive and well (if you’re really into it, there’s even a Tiki Oasis convention held every year in San Diego as well as a 3-day Ohana Luau at the Lake in New York). Vintage Tiki has also become a thing – now alongside vintage cars and clothes, people collect Tiki kitsch from days gone by – hula girl figurines, rattan furniture and carved Tiki mugs. People have realized that Tiki culture, in its weird and wonderful pseudo-Polynesian/North American form, is worth preserving. Almost nothing says TIKI like a good Mai Tai or Zombie cocktail. Cocktail culture was essentially created through Tiki in the 50s, as people began to appreciate the fine mix of good liquor (especially rum) with tropical juices, decorated with flowers, twizzle straws and pineapple. Today you can find a solidly made Mai Tai on almost any drink menu and in craft cocktail bars alongside Manhattans, Moscow Mules, Black Russians and any other classic drink. The Mai Tai is synonymous with Tiki culture. Two people claim to have created this quintessential cocktail in the 30s and 40s – Victor Bergeron from Trader Vic’s in Oakland, CA, and Don the Beachcomber at his namesake restaurant in Hollywood. Whoever the creator, “Maita'i" means “good” in Tahitian. This alcohol-heavy yet fruity delight was created by Don the Beachcomber in 1934 and became popularized at the 1939 New York World’s Fair. This simple, smooth and easy cocktail will have you dreaming of sunny skies and palm trees! Invented by head bartender Harry Yee of the Hilton Hawaiian Village in Waikiki in 1957, this colourful cocktail goes down a treat! Try your hand at these common Hawaiian words. Fun fact: the Hawaiian alphabet has only 13 letters (5 vowels and 8 consonants). 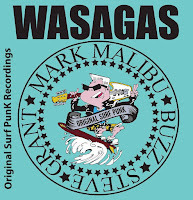 English has borrowed a number of words from Hawaiian, including ukulele; taboo; hula and muumuu. Try these before you get into the Mai Tais! Aloha: Used as a greeting or parting, but also means love, affection, kindness and goodness. Mauka & Makai: Used when giving directions on the islands, Mauka means ‘towards the mountain’ and makai means ‘towards the ocean’. ʻOhana: Family, but used beyond blood relations to express love and commitment within communities, work places, etc. Kamaʻāina: Literally, child of the land. Used to describe any long-term resident of the Hawaiian islands, regardless of racial background. Lei; A necklace made of flowers, shells, leaves, or kukui nuts. Contrary to most tourists' expectations, leis are a normal part of Hawaii life for both men and women. Locals wear them to celebrate special occasions like birthdays or promotions. 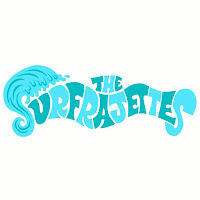 NEXT....Get ready to get your Tiki on! 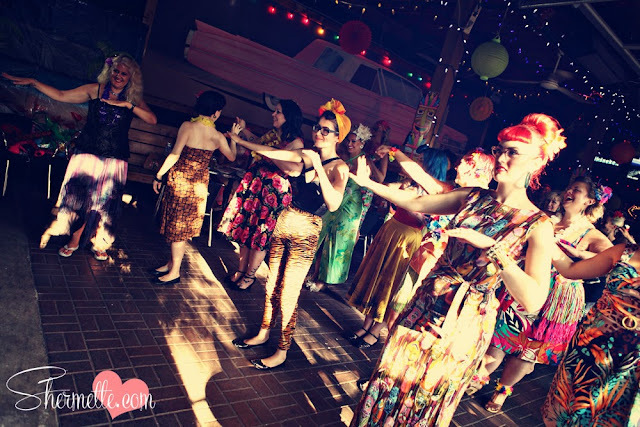 Now that you know all about Tiki, you can look forward to some Polynesian fun at the Toronto Vintage Society’s Tiki Lani Lanai on Saturday August 29th at the Cadillac Lounge! Get your hula on with some great music from The Cliff Divers, The Calrizians and Rocket XL5; a hula performance and lesson; Burlesque performances by Aviva The Mirage, Tanya Cheex and Lilla Koi: GoGo exotica by Dolly Berlin; paradise found photo booth; Vintage swim contest; loudest Hawaiian shirt competition; crowning of the Tiki King and Queen; authentic Tiki cocktails, and LOTS of prizes!! Don’t miss it! 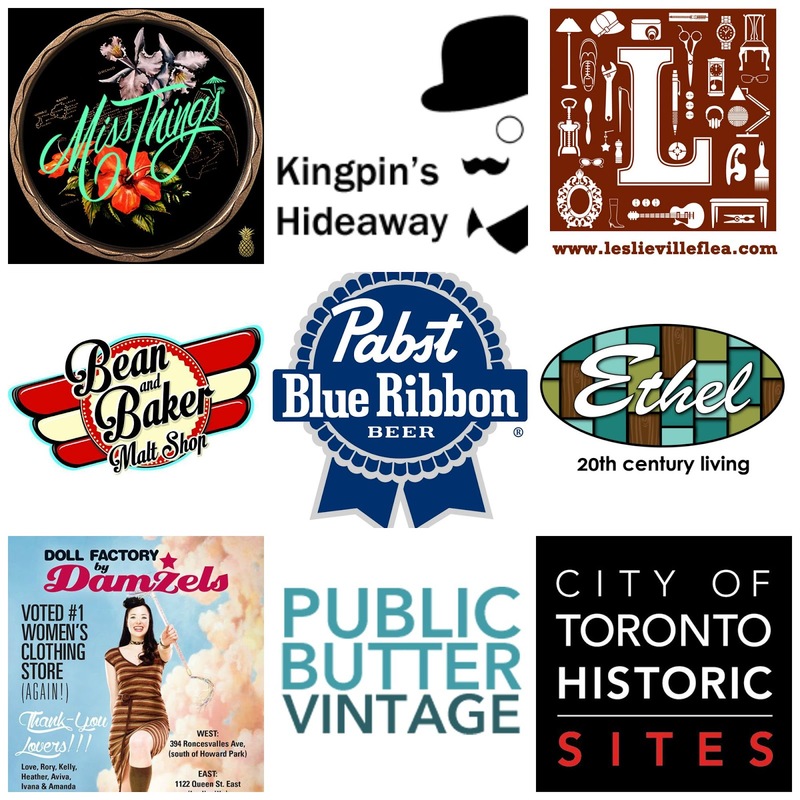 We are going to take this moment to say a BIG HUGE THANK YOU to Pabst Blue Ribbon Canada and ALL our sponsors for the generous support! Without them we not be able to have these parties and give you all the goodness we have in store! Thank you for this article. It was so interesting. I was just looking at the Blue Curaçao at the liquor store the other day, wondering what it was used in! Sounds like a very fun party coming up. Hiya LouLou,,,, if you want to try the mai tai. use the Triple sec, Contreau or even Gran Marnier instead of the blue Curaçao. Blue Curaçao is great for the Blue Hawaiian though. Your VINTAGE WEEKEND Roundup! Aug 27th-30th! Your VINTAGE WEEKEND Roundup! Aug 20-23! 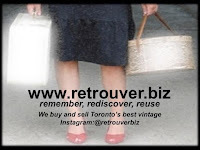 Your VINTAGE WEEKEND Roundup! Aug 13-16!